Oftentimes we KNOW what we should be doing, but we aren’t doing it. As a holistic health coach, I help people look at their lives from the outside and see how and where they can make small changes that will make a big difference. Sometimes it’s an education piece that is missing, sometimes it’s a small habit change. Everyone is different, and throughout the process different things come up for different people. I work with people where they are to push them towards sustainable lasting change that they’ll feel for years to come. I have different prices for different programs, and I wouldn’t consider my services cheap, but I wouldn’t consider them unreasonable. The work that we do can be life changing for those that commit to it, especially with how you look and feel, both emotionally and physically. Being healthy and having a healthy mindset is invaluable, and something that will stick with you for the rest of your life. I consider the work we do to be intimate, powerful, and an investment into you. Truth be told, there is NO ONE BEST diet. But there is a best diet for me, a different best diet for my partner, and still a different best diet for each of my clients. I personally work well with high quality animal products and no gluten, and someone else might work great eating a vegetarian diet. Through the work that I do, I help to find the best diet for each of my clients through careful tracking, awareness exercises, and food allergy testing. BUT, for sure, the best diet for everyone is one that is based on whole foods and that eliminates unnatural food stuffs. What do you mean by nutrient dense foods? The word nutrient density refers to the number of nutrients per calorie. Something like a piece of white bread has a very LOW nutrient density, while something like a piece of kale has a very high nutrient density. With my clients, I focus on adding in nutrient dense foods. What Cooking Oil is the best to use? I have a great blog post about this very topic, but the short answer is saturated fats work best to cook with, since their molecules are nice and stable, and therefore the most resistant to heat, light, and oxygen. Coconut oil, butter, and ghee are my go-tos. Should I be worried about my cholesterol? High cholesterol can be a sign that there is something else going on in the body. The body NEEDS cholesterol, and we make a large percent of it in our own bodies. It is also a repair substance, so it can go to places that have been damaged. The most recent book I’ve read, which does a really great job addressing this topic is Big Fat Surprise. She goes into the fact checking behind the initial studies that we inaccurately drew the conclusions that high cholesterol was an indicator of heart disease. Unfortunately for the American public, we have been wrong for a long time, and our almost ubiquitous use of statins should be questioned. For me, this question hits very close to home, since my mother has been on statins since early 2000. Again, refer to Big Fat Surprise, or anything written by Michael Pollan, because again it turns out that we drew the wrong conclusions from some very selectively sorted out data. Our high use of vegetable oils and heavy scolding on bacon, fat, and animal products since the 1960s has led us to the obesity and diabetes crisis. I still hear when someone looks at a cheeseburger that “it’s a heart attack waiting to happen.” It’s time to start changing our perspective. YES! You do. Not all farmers who use organic methods are certified organic, simply because it can be expensive to do so. But that is because there is oversight, which is a good thing. Here’s a link to National Organic Standards. Organic Agriculture : Synthetic and petroleum derived fertilizers and pesticides are not allowed, neither are genetically modified seeds and sewage sludge. Antibiotics are only allowed to treat blight on apples and pears. Organic farm fields must have zones to buffer from contamination from conventional fields. Crops cannot be treated with chemical solvents, irradiated after harvesting, or stored in fumigated bins. Is all organic created equal? NO, NOT ALL ORGANIC IS CREATED EQUAL. There are large organic farms such as Horizon and Earthbound, that although they have some benefit, they are still monocropping and holding animals in large pens. Cornicopia.org is a GREAT organic consumer watchdog. 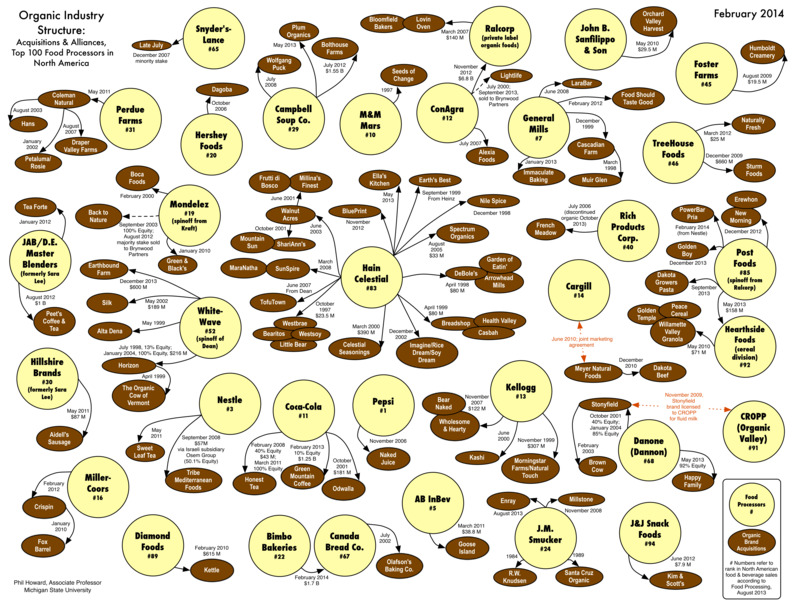 Here’s a great graphic that tells us which big companies own what. You’ll be surprised. How do I get rid of my GERD or Acid Reflux? Acid Reflux or GERD can be caused by eating the wrong things at the wrong times, like right before bed. There is debate out there that it can actually be caused by too little stomach acid, which is very much against what we’ve been taught. Chris Kresser has a good blog post about the topic. I would suggest to research the idea of taking antacids, and proton pump inhibitors like prilosec. For years, I was told to take these, and in turns out that I have low stomach acid, not high! Proton pump inhibitors also turn off the parietel cells which make stomach acid, and this can also turn off the making of intrinsic factor, which binds with vitamin vitamin b12 to allow our body to absorb it. B12 is extremely important for memory, balance, and nerve function. Why do I have bloating and gas? Chances are you are eating something that either wasn’t prepared correctly, or you are eating something that you are sensitive to. Sometimes raw foods and salads can be the culprit, sometimes gluten is. This is one area in which it’s different for everybody, and you need to be a bit of a food detective to figure out what it is. Can I fix my skin problems with diet? Most likely, YES. The skin is one of the easiest ways to see if you are eating and living right. The skin is our largest organ of detoxification, and when we are living in a way that doesn’t support our health, our skin is the first place you can tell. I personally used to have a lot of problems with acne, and as soon as I cleaned up my diet, so did my skin. I’m very forgetful, and feel that my brain is foggy, can that be diet related? Yes! The brain is the first place that we suffer from malnutrition since it’s such a hog of our energy resources. 20% of our resources goes to feeding our brain, and it never goes to sleep. So if you aren’t eating right, then chances are your brain performance is sure to suffer.